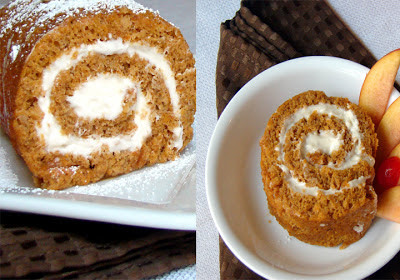 Pumpkin cake rolls is perfect for holidays and is a yummy dessert You can make it well in advance. 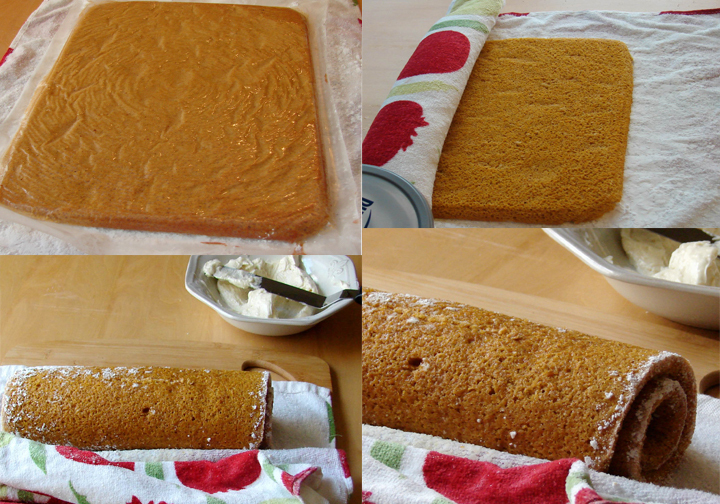 It is thin sheets of spiced pumpkin cake sheets filled with sweet cream cheese frosting. Pre heat oven to 375 degree. Grease a 15-in x 10-in baking pan or a jelly roll pan.Line it with wax paper and grease the top of wax paper again and keep aside. ix all the dry ingredients,flour,ground cinnamon,ground ginger,ground clove,salt and baking soda and keep aside. In a large bowl beat egg till it is light and pale ( you an also separate egg yolks and whites and beat separately). Gradually add sugar one spoon at a time till it is thick and lemon colored. This will take five minutes. Gradually add pumpkin puree and fold in.Combine ad fold in gently the flour mixture in little additions. The batter at tis stage is light and will be little runny. Pour this into the greased baking pan. Spread evenly with a spatula. bake this for about 10-12 minute or till tooth pick inserted comes out clean. The cake will spring back when touched. Take a clean kitchen towel and lay it on the counter. Dust generously with confectionery sugar.As soon as the cake comes out of the oven flip it over the towel. Loosen the edges of the wax paper from all four sides and gently and slowly peel off the wax paper. Roll the cake up in the towel starting from the end that is towards you. Allow this to cool and refrigerate for about an hour. Mean while using a hand mixer beat cream cheese and butter and vanilla essence till light and fluffy, Gradually add lemon zest and confectionery sugar till light and fluffy. Awesome clicks and perfect outcome..
Yup perfect for holidays n perfectly made dear!!! Mouthwatering cake roll suja..yum yum. Well made dear :) Perfect and awesome!! Delicious pumpkin cake roll Suja. Apt for occasion. a killer looking roll suja; this one is bookmarked ! Perfectly done !! Love it Suja..
Yummy and I loved the presentation..Seems you are enjoying the season..Hope you are okay. I love pumpkin.. we had pumpkin pancakes for breakfast today.. this looks tempting.. can't wait to try this. Very attractive and beautifully done rolls, wish i get a slice now. That's a great looking roll cake... Would love a bite. This looks delish! I love pumpkin desserts. Thanks so much for linking up to Creative Thursday. Can’t wait to see what you share this week! Have a wonderful week.